During the last days of our time together, we capped off our amazing journey — with lovely meals and snacks with friends and colleagues — focusing on our collective preparations to participate in and celebrate the 2020 Nightingale Bicentenary in less than four years from now. Above, after visiting St Paul’s Cathedral, we found a lovely nearby coffee place where we supped with Jill Iliffe, the CEO of the Commonwealth Nurses & Midwives Federation (CNMF). We especially wanted to thank her again for hosting us at their 3rd International Conference and for facilitating our further planning for the 2020 Bicentenary with CNMF's Board of Directors at their the 2016 Annual General Meeting. Again we were inspired to ponder — together — how best to prepare to celebrate Nightingale’s vision for nurses during her Bicentenary. Maps derived from Google Maps. Photos from NIGH’s archives and Phakakshi Manjrekar’s camera. It was like a pilgrimage for us to especially remember Nightingale by visiting perhaps the most famous of all her statues — at London’s Crimean War Memorial. It was quite a sight to see her standing so tall above us — in the remarkable clear blue sky. Flanked on all four sides of her statue are detailed bronze-relief depictions of her care and commitment to British and Turkish soldiers, shown here on the left. 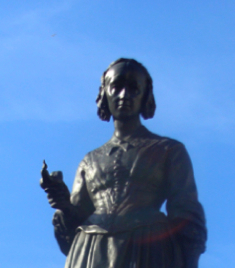 “With one exception few of the leading figures emerged from the Crimean War with enhanced reputations… [this was] Miss Florence… Nightingale…. With few nurses and scanty equipment, she reduced the death-rate at Scutari from 42 % to 22 per thousand men. Her influence and example were far-reaching. The Red Cross movement... was the outcome of her work, as were great administrative reforms in civilian hospitals. Our guide for this ‘pilgrimage’ was our dear friend and colleague the Reverend Tom Keighley, who is also a British nursing leader who now serves as a consultant to the European Union and particularly for the EU’s newest nations, as they prepare their nursing workforce to meet EU health care standards. Over lunch at the Royal Naval Club, we shared our plans for the Nightingale’s 2020 Bicentenary and received some great suggestions from Tom, who also serves as one of NIGH’s international Advisors. ​All photos for this Blog are from NIGH’s archives and Phalakshi Manjrekar’s camera. We were both privileged to present at this Conference — attended by representative leaders from 53 Commonwealth nations and all continents. The above photo captures the opening Panel Presentation of this widely-respected Conference, convened bi-ennially in London, UK. 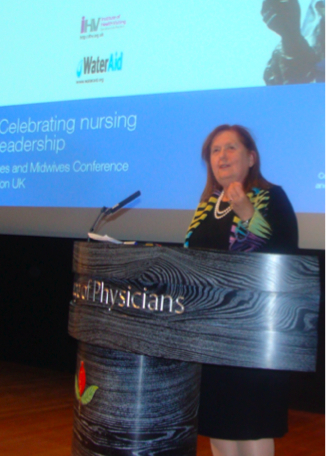 It was indeed an honour for Deva- Marie to present a keynote speech — just before ICN President Judith Shamian’s own keynote — during the last hours of the CNMF Conference, convened at the prestigious Royal College of Physicians in London. Deva-Marie's keynote shared a ‘2020 vision’ of how nursing leaders from everywhere can become leading publicly-recognized advocates for achieving the 17 new United Nations Sustainable Development Goals (SDGs) — all seen as critical factors in the health of humanity. Dr. Shamian’s own stirring keynote envisioned the ‘IMPACT’ that nurses leaders and all nurses can make as we upgrade the way we see ourselves and become much more pro-active to influence public policy regarding health planning and health outcomes in each of our own nations. At the end of this inspired Conference, everyone rushed to capture photo memories of our such a great opportunities to be together from so many places across the world. A few of the photos we captured are featured here below. From the left, NIGH’s Deva-Marie Beck and Phalakshi Manjrekar with India’s Sunita Lawrence, beside Judtih Shamian and Frances Hughes — President and CEO of the International Council of Nurses (ICN) — beside Anita Deodhar, President of the national Trained Nurses Association of India (TNAI). From the left, beside Deva-Marie & Phalakshi, is Yoko Leong, a Public Health Nurse from Berkeley California — originally from Japan — beside Malasia’s Ramziah Binti Ahmad, President of CNMF and Suraya Noraidah Abdullah, President of the Brunei Drussalam Nurses Association. Here, Deva-Marie, Anita, Phalakshi and Sunita surround our friend and colleague Kwaku Asante-Krobea, President of the Ghanaian Nurses Association in West Africa. All photos in this Blog are from NIGH’s archives and Phakakshi Manjrekar’s camera. 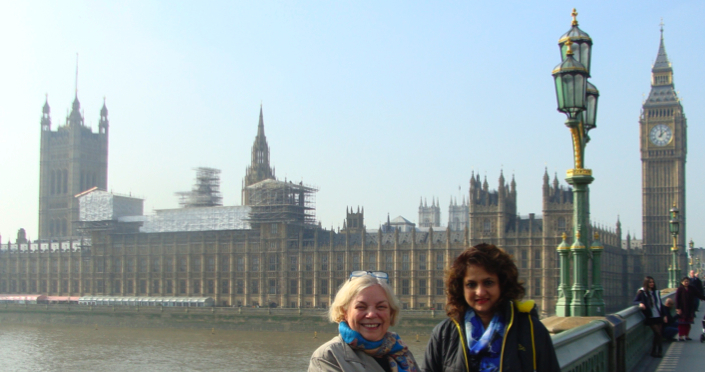 During our first days in London, we enjoyed walking under a beautiful sunny sky on and around the iconic Westminster Bridge. Across, on the east side of the Bridge, the Florence Nightingale Museum is tucked in beside the famous St Thomas Hospital — a building that Nightingale, herself, originally helped to design. While there, we reconnected with our friend and colleague Natasha McEnroe, the Museum’s Director, who is also serving to coordinate all the efforts of growing list of “Nightingale 2020 Partners” who are now planning many ways to celebrate her Bicentenary. 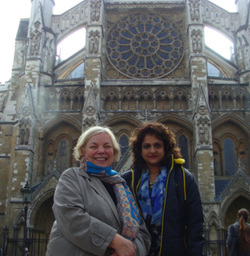 Then we walked across to the east side of the Bridge to enjoy an in-depth tour of Westminster Abbey, the ‘Cathedral’ where a Service Honouring Nightingale and Nurses is convened annually, near her birthday in May. While at the Abbey, we requested and were granted special permission to visit the Nursing Memorial Chapel — sited behind a tiny locked door, and up a steep winding staircase — in an small alcove high above Abbey’s ground floor. 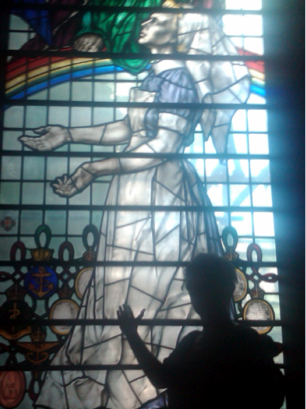 There we found an inspired stained glass window — created to honour the sacrifice of nurses during the two World Wars. This was quite a moving moment for us as we both prayed silently — each according to our own faith traditions — for the nurses of the world and for Divine guidance to prepare NIGH’s plans to globally celebrate today’s nurses and midwives during the 2020 Nightingale Bicentenary. We were not allowed to take pictures in the Abbey, but here, at the left, is a picture posted online, by the American Journal of Nurses, from an earlier visit to this Chapel, when such permission was granted. Thanks to AJN for making this beautiful photo available to everyone online. All of the above other pictures are from NIGH's archives and Phalakshi Manjrekar's camera. Our first distinguished Geneva meeting was with Dr. Frances Hughes — the newly appointed CEO of the International Council of Nurses (ICN) — and some of her staff. 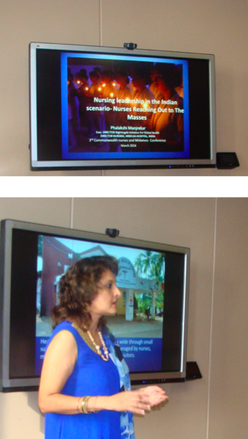 Our discussion ranged across Phalakshi’s briefing of current Indian nursing challenges and our sharing of NIGH’s history and proposed plans for the Year 2020 Nightingale Bicentenary. Dr. Hughes also provided us with an illuminating review of her work, as the first ICN CEO to be appointed from the Southern Hemisphere. Her sharings highlighted her service as Chief Nursing Officer of New Zealand, and of the Australian state of Queensland and her Regional work with the World Health Organization (WHO) to understand and promote the dynamics of health care across many of the remote islands of the South Pacific. We were sorry to miss the chance to meet, this time, with Mwansa Nkowane — the ‘Focal Point for Nursing & Midwifery’ — at the Healthcare Workforce Department of the World Health Organization (WHO). This photo above remembers and appreciates our 2014 visit to Geneva and WHO — showing us standing on each side of Mwansa — on the right — with Dr. Prakin Suchaxaya on the left — the Regional Nursing Officer at the WHO SEARO Office in New Delhi. Although we missed meeting with Mwansa — who was on travel-duty when we were in Geneva in 2016 — we enjoyed the wonderful opportunity to meet again with Tomas Allen WHO’s Librarian. Tomas regularly welcomes visitors and researchers from everywhere around the world, assisting them to access WHO’s extensive collections books and publications and to research an array of issues related to health and health development. On the day we were there, Tomas briefed us about the latest findings related to the Zika virus epidemic and its risks. We are always very happy to visit with Tomas, our good friend and colleague, whose hometown is Roblin, Manitoba, the rural village where Deva-Marie's husband and our NIGH colleague — Wayne Kines — was also born! Since before NIGH was formally established in 2004 — and during all our years since then — Cyril has served on NIGH’s Board of Directors and advised us, as we have grown — particularly on our emerging participation in ‘global civil society’ — as an official NGO working with the United Nations to promote global goals. We also had the great opportunity to visit the Hospitaux Universitaires de Geneve (HUG) and meet with Marie-Jose Roulin, the Assistant Director of Nurses there. This meeting became an excellent co-briefing — between Phalakshi and Marie-Jose — about the challenges and joys of serving in hospital leadership through these roles. Despite the obvious differences between this hospital in Switzerland and Phalakshi's hospital in India, we also noted many similarities and a common ground of care and concern — of nurses — for the health of peoples in Geneva and in Mumbai. Our 'host' for this meeting was our friend, Geneva-based Tony Murdoch, who had earlier served as HUG's Director of Communications, as well as in similar roles at the International Red Cross and the International Public Relations Association (IPRA). After our meeting with Marie-Jose, Tony took some extra time to review NIGH's initial plans to celebrate the 2020 Nightingale Bicentenary and to share some timely 'PR' advice with us! All above photos are from NIGH’s archives and Phakakshi Manjrekar’s camera. During the first weeks of March, 2016, we met and traveled — to key ‘global’ sites in Europe — to together represent the Nightingale Initiative for Global Health (NIGH). 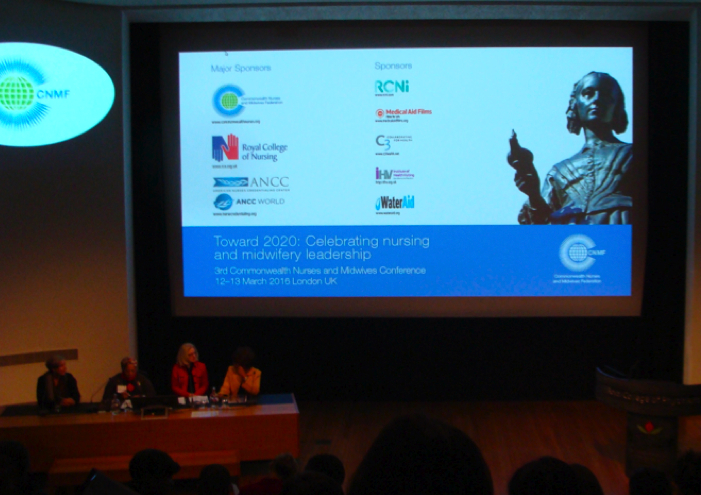 On behalf of NIGH, we joined growing teams and networks, worldwide, as we prepare collaborative plans for participating in the upcoming 2020 Florence Nightingale Bicentenary Year. During our first days together, we made a point of taking our own photo, below, in front of the historic ‘Palais de Nations’ — the site where the United Nations has its European Headquarters. We did this to remember that our current NIGH projects highlight public advocacy for achieving the 17 new SDGs — 'Sustainable Development Goals' — officially set by the United Nations General Assembly in 2015. 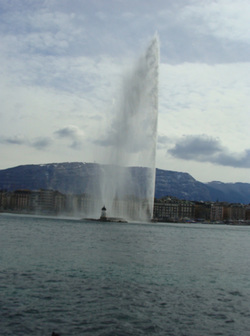 Today, Geneva continues to be an historic international city — also the founding home of the International Red Cross and many United Nations Agencies and Organizations, including the World Health Organization (WHO) and the International Labour Organization (ILO), as well as prominent international NGOs working on many aspects of achieving global peace, understanding and development. Above photos from NIGH’s archives and Phalakshi Manjrekar’s camera.